The University of Washington has earned a perfect score on the The Princeton Review’s Green Rating system for the eighth straight year. The UW is one of 26 colleges and universities to be named to the Green Honor Roll with a perfect score in the 2019 rankings, out of 648 schools reviewed. The Princeton Review annually releases its Green Honor Roll list as part of the company's college rankings. The ratings attempt to measure how well schools provide a healthy and sustainable quality of life for students, how well they prepare students for a world defined by environmental concerns and opportunities, and if their policies are environmentally responsible. The University of Washington’s submission includes information from the Seattle, UW Bothell and UW Tacoma campuses. The ratings include questions on areas such as waste diversion, commuting options, local and sustainable food options, new building construction practices and whether the school has a formal committee with participation from students that is devoted to advancing sustainability on campus, as well as other categories. 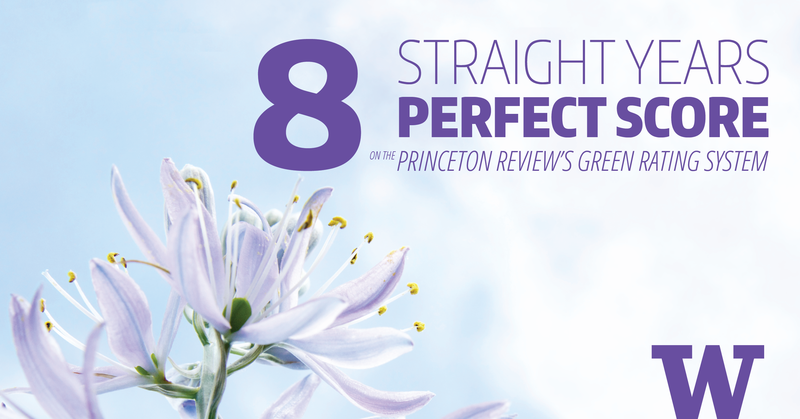 For more information, see The Princeton Review's Green Honor Roll list.